Connect to Microsoft Access databases from Excel/Filemaker. Is there a better alternative to Actual ODBC Driver for Access? Is Actual ODBC Driver for Access really the best app in Applications category? Will Actual ODBC Driver for Access work good on macOS 10.13.4? 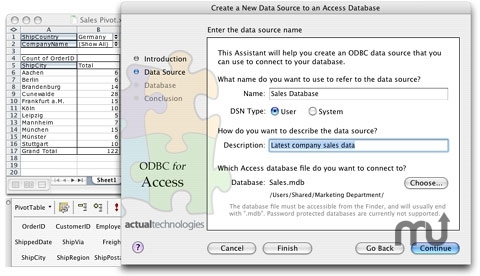 With the Actual ODBC Driver for Access, you can connect to Microsoft Access databases and import data directly into an Excel spreadsheet or a FileMaker database. There is no need for an intermediary Windows PC - this driver reads data from the database file itself. The driver supports Access 97 or later, including Access 2003. The Actual ODBC Driver for Access is the first commercial driver to connect to Access databases on a Mac without the need for complicated "bridge" or "router" solutions. A setup assistant, diagnostic utility, and on-line help are included with the easy-to-use installer. Version 3.2.0: Release notes were unavailable when this listing was updated. Actual ODBC Driver for Access needs a rating. Be the first to rate this app and get the discussion started! The driver also lets you use a text file or Excel spreadsheet as a SQL database. The driver supports standard SQL "select" and "join" statements to return data from multiple tables. The current version of the driver is read-only - "insert" and "update" SQL statements are not supported. In addition to Access ".mdb" and ".accdb" files, the driver also works with tab delimited text files, ".csv" files and Excel ".xls" files.